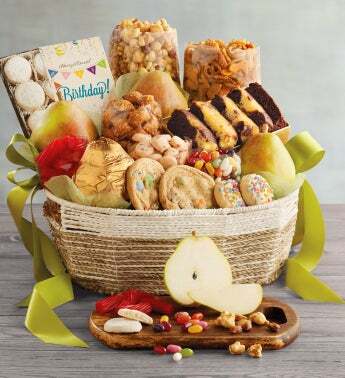 Delight someone on their special day with a basket full of sweet and savory treats. Our legendary Royal Verano® Pears top this gift, complemented by a rich chocolate swirl cake, tasty peanut butter pretzels, and much more. We've also included a delicious assortment of cookies and candies—enough for several days of celebratory snacking.